Nail fungus is a common foot condition that can be difficult to treat. At its core, nail fungus is a skin infection under the nail. While this condition is not painful, it can still cause obvious visual side effects. The symptoms include fragile nails, nails with a yellowish color or with white spots, nails with heavily distorted shapes, or the nail can even completely detach from the skin. When left in a warm and moist environment for too long, nails will begin to develop fungus. While this fungus can sometimes affect fingernails, most people will experience nail fungus with their toenails. This is because shoes can create the conditions needed for the fungus to grow. If left untreated, the nail fungus can continue to spread to the other toes and the surrounding skin. Thankfully, there are several treatment options for patients. Laser treatment is one of the newest and most effective ways to treat toenail fungus. Our podiatrist in Nassau County (working out of Merrick, Bellmore, East Meadow, Wantagh) at Cherrywood Foot Care can use this procedure to eliminate toenail fungus and its symptoms. The entire laser process is simple and extremely safe. For this procedure, infrared light is used to eliminate the pathogens that cause toenail fungus without doing damage to the nail or the toe. While 2-3 laser treatments are usually needed to maximize its effectiveness, most people will experience immediate relief after the first procedure. The entire procedure can last between 20 and 30 minutes. There are several unique benefits of using laser treatment to treat toenail fungus. These benefits make it a fantastic alternative to other treatment options such as medication. One primary benefit is that there are no severe side effects. In some rare cases, a person might feel slight discomfort after the procedure is over. These feelings are insignificant and will quickly dissipate. In addition to the lack of side effects, there is also no recovery period after the procedure. Here at Cherrywood Foot Care, laser treatment is just one way our podiatrist in Nassau County can treat toenail fungus. In addition to this procedure, we will also provide several steps that you can take to prevent future infections. Are you are suffering from toenail fungus? We serve those in Merrick, Wantagh, Bellmore, and other parts of Nassau! 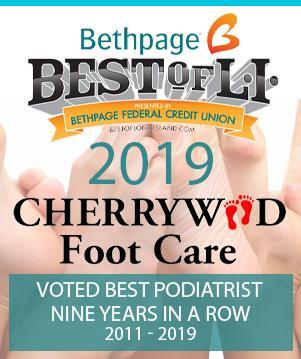 Be sure to contact our podiatrist in Nassau County at Cherrywood Foot Care to get treated today!